You look gorgeous, love the leather jacket! Very nice jacket ! Beautiful look ! La noi e prea frig pt. asemenea outfit.. astept primavara! You are so good at layering, I wish I was that good ..
You look stunning in that vest! Layering is really fashionable especially during Winter. You are looking good. adorable look and love all the layering! Love these looks. I really like your jacket. love the jacket <3 you look lovely! 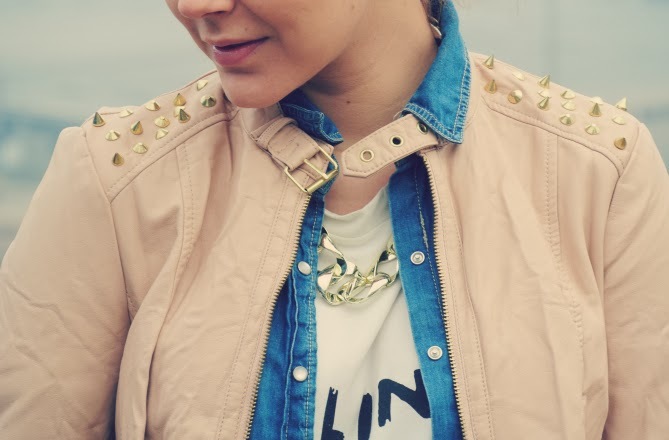 I love the denim top with that blush colored jacket- it's such a pretty combination! Nice look. I really love your boots. I love your outfit, how you've done all the layers. It's a great look and a great post about all the different ways to layer. You are so pretty! I love your look! Thanks for visiting my blog, and of course we can follow each other! lovely styling, great tones and pieces you've used. Hello,I ´m following, I hope. Kisses. Your style looks great, I will definetely check your other posts for some cool style inspiration. By the way, your eye shape is great! hi Sorana , i took a look at your blog and i like much-such a great face ;-) also nice style&ideas.. Would you like to follow each other;?let me know..